Imagine a cityscape that is nothing more than a typical concrete jungle so common in many cities. Roaming the streets, you’re met only with buildings and high rises forged with concrete and steel, a sight you’ve no doubt grown accustomed to if you’ve spent any time in an urban area. It’s easy to feel walled in and want to look upward desperately for a scant glimpse of blue sky, and finding any greenery in a city is rare, unless you make your way to a city park. 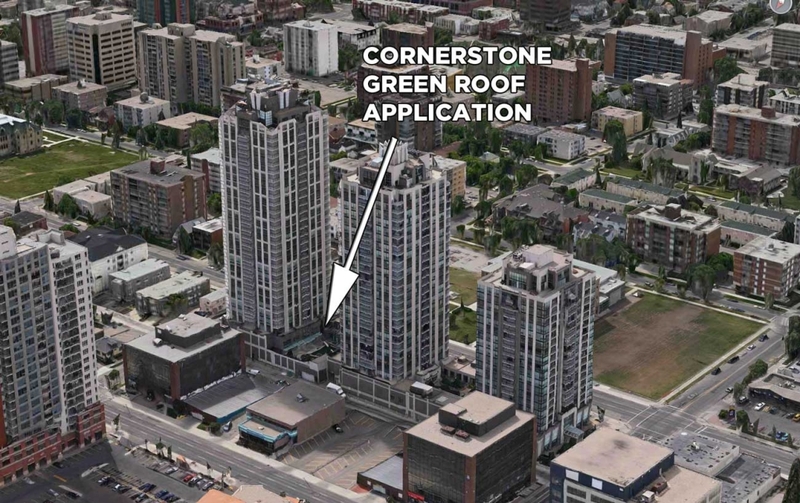 Now, contrast that image with city housing buildings that have been constructed using retaining wall blocks for green roof, like many we offer at CornerStone Wall Solutions, and the landscape suddenly shifts from drab and tired to open, airy, and full of life and color. 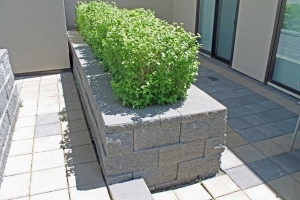 Our retaining wall blocks are a great choice for green roof urban planning. 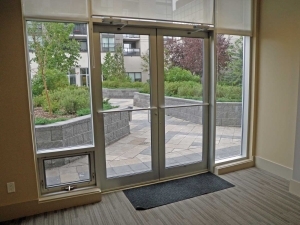 Not only do they (literally) infuse residential and commercial buildings with life, but they can be used for a variety of practical and environmentally impactful uses. 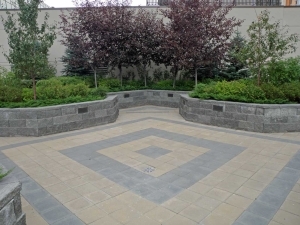 Our retaining wall blocks have a hollow core, perfect for green roof applications, which allows for a number of functions, such as adding lighting, corners, curves or extra drainage for water. The hollow core of these blocks also means that handling them is much easier than solid blocks, shipping them is less of a hassle for all parties, and lifting them up with a crane for use at heights is far less arduous and expensive. Saving developers and General contractors money. Green roofs are gaining in popularity because they can improve the environment. 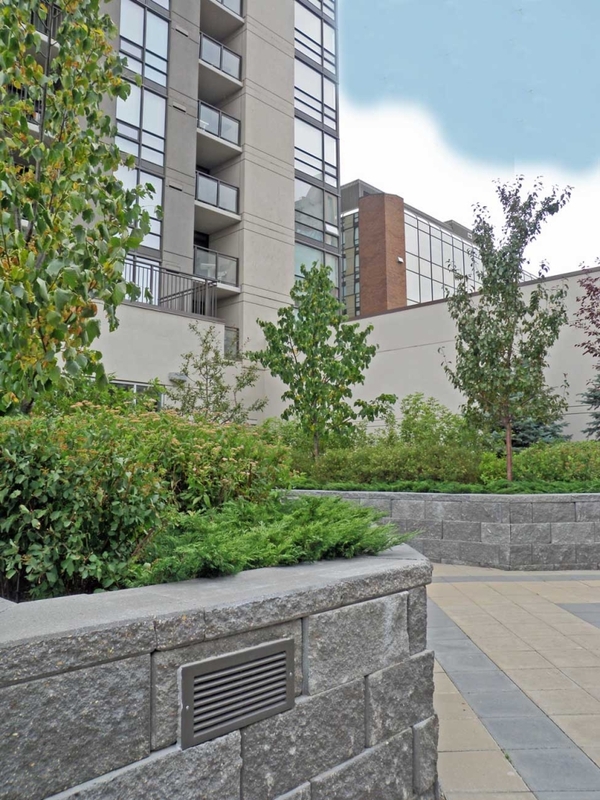 We are excited that our retaining wall blocks have already been used for green roof structures in many urban projects, such as the Calgary Beltline, in Calgary, Alberta. Stella, Nova which was built 7 years ago and contains 2 residential towers housing 300 condo apartment units. 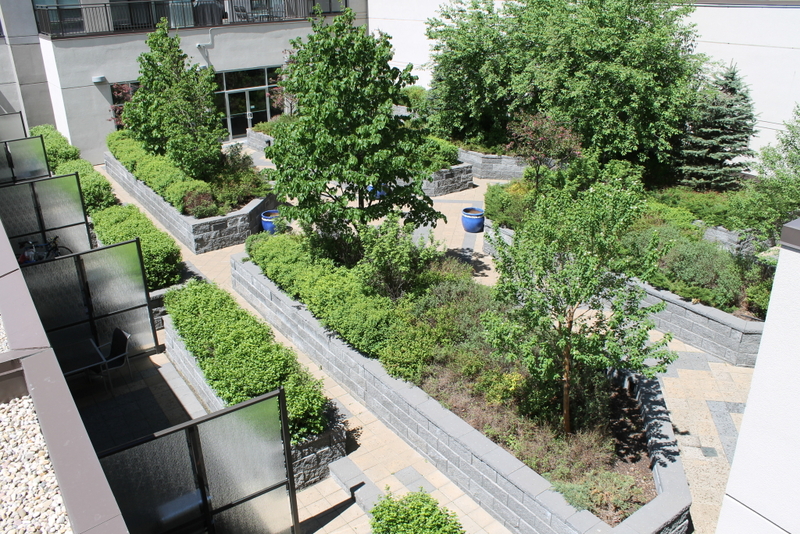 The second floor garden area has benches and a common area green living for the residents. 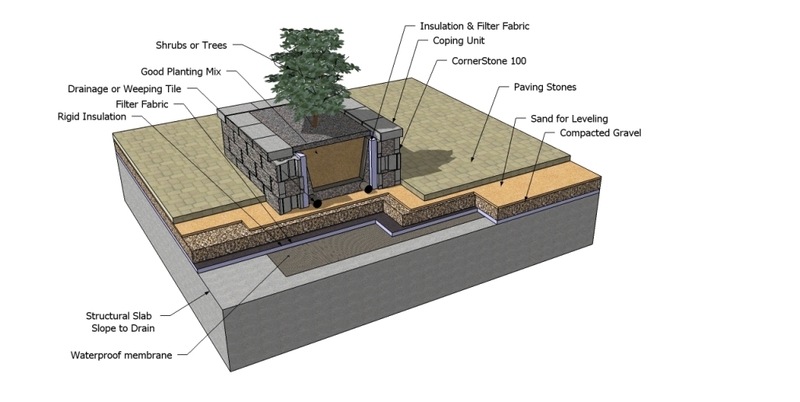 In this project and many others, our retaining wall blocks offered many great options for creating green roof pathways. Their hollow cores make it easy to maintain things like sprinkler lines to bring water to the rooftop gardens or simply cutting the blocks to add lighting, helping to improve the appearance of the buildings and the overall quality of life of the residents. Lighting for green roof cored through the hollow core. Aside from the positive aesthetic effect of green roofs, there are numerous other benefits to consider. Within cities, there can be a proliferation of what is known as a heat island effect. A heat island is unique to cities due to the construction of buildings and the density of the population. Heat islands not only raise the temperature, they can also lessen comfort and the quality of life in urban areas. 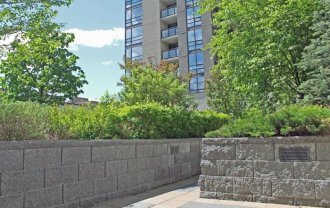 The effects of a heat island can be mitigated through the use of green roofs, and CornerStone’s retaining wall blocks make it easy to incorporate these designs into your building projects. Our CornerStone retaining wall blocks being used for green roof applications improve quality of life in other ways as well. Growing and nurturing a garden can often be fulfilling and enriching, adding not just beauty but in some cases, also providing healthy, sustainable access to fresh fruits, vegetables, and herbs. 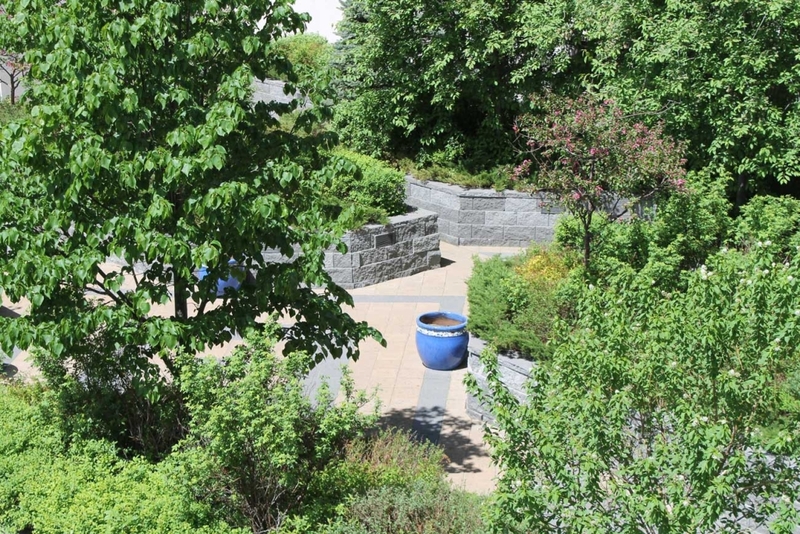 More forward-thinking residential complexes and businesses are adding a garden for inhabitants and employees to rest or relax in, improving the overall comfort and health of city dwellers. Above all, we aim to create usable spaces for commercial and residential areas and promote a positive impact on the environment by allowing for green roofs to be created easily. We’re so pleased to offer a product that makes it possible to fully thrive wherever you live and work.